He says that avoiding a "hard border" between EU member Ireland and the U.K.'s Northern Ireland "looks like a new version of the Gordian Knot. Unfortunately I can't see a new version of Alexander the Great." Legend has it that the ancient Greek king used his sword to cut through the knot. Asked by a reporter whether he was referring to former foreign secretary and Brexit champion Boris Johnson — whose first name is Alexander — Tusk said: "To compare Boris Johnson to Alexander the Great is an exaggeration, I think." 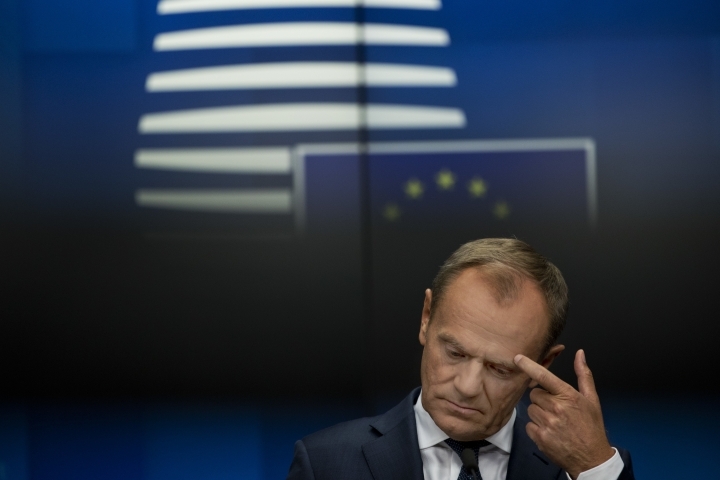 European Council President Donald Tusk is demanding that British Prime Minister Theresa May make "concrete proposals" this week for ending the Brexit impasse. "I hope that tomorrow Prime Minister May will present something creative enough to solve this impasse," he said in Brussels. Tusk will be chairing the Brexit meeting on Wednesday during which May is set to address her 27 counterparts before they break off to discuss progress among themselves. Britain is due to leave the EU in March but a deal has to be agreed way before then in order to give relevant parliaments the time to give their verdict. Germany's main industry lobby group is urging leaders at this week's European Union summit to work hard to secure Britain a transition period after Brexit. The Federation of German Industries' director general, Joachim Lang, said the key to securing a transition phase is "that a sense of reality finally spreads in the United Kingdom. Fear of the abyss must spur the imagination." Britain is in danger of crashing out of the EU in March without an agreement, which would mean companies wouldn't have time to adjust to a future trading relationship. Lang said a transition period is "indispensable" and added that the "best path" would be for Britain to remain in the tariff-free and frictionless single market and customs union. One of Ford Motor Co.'s top executives in Europe says a hard Brexit would be a significant threat to the U.K. auto industry. Steven Armstrong, Ford's president for Europe, Middle East and Africa, says the company would do whatever was necessary "to protect our business" if Britain were to leave the European Union without an agreement on future relations, forcing cross-border trade to take place under World Trade Organization rules. Armstrong says even a Canada-style free trade agreement would result in border delays that would undermine the company's "just-in-time" manufacturing system, which relies on parts being shipped from suppliers to manufacturing plants as they are needed. He says "if the U.K. is to remain competitive, any U.K.-EU trade deal must ensure guaranteed frictionless trade so that industry can plan for the longer term." 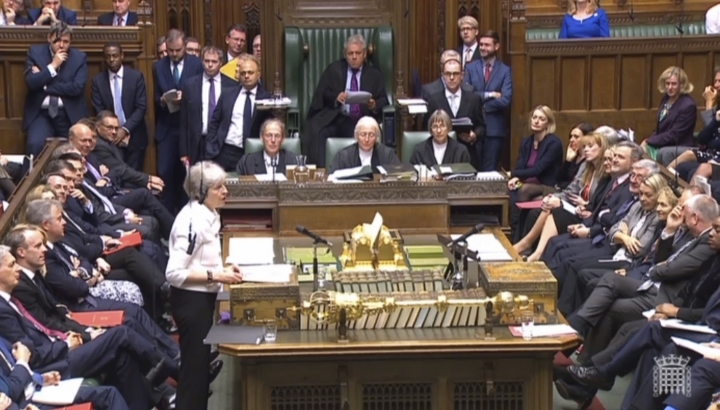 British Prime Minister Theresa May has urged her divided Cabinet to back her as Brexit negotiations with the European Union go down to the wire. At a marathon three-hour Cabinet meeting Tuesday, May said the government must "stand together and stand firm." A day before a crucial EU summit, talks have hit a logjam over the complex issue of the Irish border, which will mark the only land frontier between the U.K. and the bloc after Britain leaves next year. The EU is waiting for new proposals from Britain. But May's room for compromise is restricted by divisions within her Conservative Party, and by her reliance on Northern Ireland's Democratic Unionist Party, which opposes any compromise on the border. In the near-term, May is hoping to stave off potential resignations over her Brexit approach and keep her Cabinet behind her. The European Union's chief Brexit negotiator, Michel Barnier, says a deal with Britain might not come before November after talks hit an impasse over the weekend. Speaking on the eve of an EU leaders' summit in Brussels, Barnier said several issues needed to be dealt with, including the future of the border between EU member Ireland and Northern Ireland, which is part of the United Kingdom. "We are not there yet," he said. More time is needed, he said, to agree an "overall accord." "We will use that time, calmly, with serious intent to find the overall deal in the coming weeks." Barnier's comments have more or less put paid to any prospect of a decisive breakthrough at this week's summit. Since the Brexit discussions began over 18 months ago, this October's summit had been earmarked as the most likely date for any agreement given the need to get necessary parliamentary approvals before Britain officially leaves the EU next March. Austria's European affairs minister says Brexit talks are making progress but that an imminent breakthrough appears unlikely. A day ahead of a "moment of truth" EU summit, Gernot Bluemel said the "the dynamics in the negotiations are going in the right direction." However, he said Tuesday that a compromise deal in time for this week's two-day summit was unlikely. Bluemel's voice matters as his country holds the EU's rotating presidency. The talks have got bogged down over how to make sure a physical border does not reappear between Northern Ireland in the U.K. and EU member state Ireland.